I make a point of installing all updates but these failed repeatedly and after wasting half a day trying to install them I just quit, which is pretty rare for me. Also a rare occurrence is to o ask the IT department for help, but as they could dedicate time to the issue I just let it ride. They did manage to get more than half of the outstanding upgrades to install, mainly but installing them one by one, but the last two proved too stubborn. Which leads me today when an electrician decided to disconnect a certain circuit that did not seem to be in use. To be fair I do not think it was labelled correctly, but none the less that took out the entire development, QA and design teams in one foul swoop. Five minutes later the power was back on and everyone was powering up their machines... Needless to say that was when Windows 8 decided I must have rebooted to install updates and it took 29 minutes to fail at that task and let me log-in at which point I did not have enough time to get Visual Studio loaded with my project before it was home time. So I sort of forgot to mention the new homepage. See that red "?" in a circle ? That is where the "tunnel" will go. 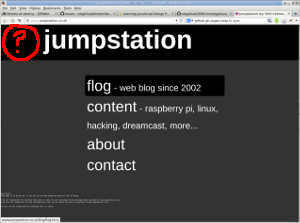 Back in 2002 I created a Java applet that set in the same place offering visitors a touch of random. Browsers started to make it more and more difficult to support Java applets and I used to see a broken plugin icon there(if I ever visited the homepage). Eventually browser just hide any sign that a Java applet has failed to load and I forgot about it. The homepage was always designed to showcase what I was working on. Re-ordering when new and exciting things came along. But then I started to use the flog for that side of the website and the homepage fell into disrepair(the layout was tables!). For a long time I felt I wanted to make the flog more prominent as it was the only pages being regularly updated. So I opted for the super simple/clean layout you can see there now, but at the same time I longed for the Java applet that had had its home there for so long. I found the ancient applet source code and found it unreadable. Lots of double letter variables and a distinct lack of comments. I was able to recover a total of zilch, still this meant I could start from scratch and produce the next evolution in homepage random tunnels. The code and graphics are 95% done, the only thing remaining is the boring bits. Which is maybe why I am so easily distracted by things like the Wheel of Destiny. Originally it was "wheel of Dev" and contained the names of all the developers at work. Born of a random brain fart when asked who should do a the mundane jog of merging this releases project branches. 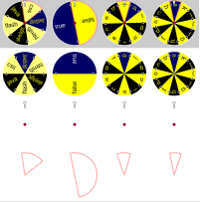 Dynamically created html5 canvas "Wheel". Full theming of colours and settings. Callback of the "winning" slice's value for any purpose needed. Sizing and scaling based on html/css containers width/height. Bounce back from the pointer when slowing down. Github page with demos, demos. There is the composite at the top, followed by wheel and its attachments, then the pointer and centre, finally the slice selection. If you are interested in the genesis of this project it all started on jsfiddle. Wheel of Dev. Works perfectly as long as you do not change anything. 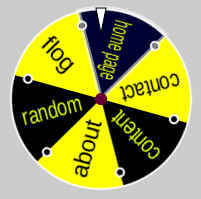 Wheel of Dev(sizeablity). Concentrating on the sizing and scaling. Wheel of Destiny. Rewriting the math from scratch to actually work with different numbers of slices. With Wheel of Destiny out of my mind I can get on with filling that odd gap on the new home page, which is what I should have been concentrating on!